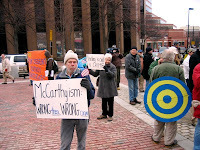 AfD council member Bonnie Preston, from Maine, sent photos of a protest February 19, in Portland ME, against S1959. Maine's Senator Susan Collins introduced the bill in the Senate; it was passed earlier this year in the House. RadioActive, a weekly news show on WERU-FM, community radio from Blue Hill, Maine, covered the demonstration, and you can listen to an archive of the broadcast here. 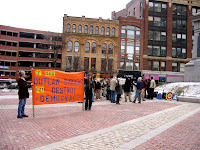 The demonstration brought about 50 people out to hear speakers including Maureen Block, one of the organizers of the event; Shenna Bellows of the Maine Civil Liberties Union; Logan Perkins of the Native Forest Network; and Robert Shetterly, activist/artist, creator of “Americans Who Tell the Truth”. Logan Perkins pointed out that activists are already being harassed in Maine, setting a precedent for even more intimidation if this bill is passed.